This policy applies to the work of Edenbridge U3A (referred to as ‘the U3A’). It sets out the requirements that the U3A must gather personal information for membership purposes. The policy details how personal information will be gathered, stored and managed in line with data protection principles and the EU General Data Protection Regulation 25th May 2018. The policy is reviewed on an ongoing basis by the U3A Committee Members to ensure that the U3A is compliant. · 1. General Data Protection and Privacy. This part is for those who would like an overview in relatively straight-forward terms about the way we collect, store and share data within the U3A. · 2. Privacy Advice. This is accessible to all and contains advice for all members and Group Contacts relating to keeping our data as secure as we possibly can. This section replaces the Privacy Advice section formerly displayed on the website. · 3. General Principles and Advice for Committee Members. This part is open to all and gives advice on the implementation of the policy by the Committee and others such as Group Contacts. Protects the rights of members, the Committee, Speakers, Partners and Neighbouring U3As with whom we have an agreement. Is open about how it stores and processes members’ data. Edenbridge U3A treats your privacy rights seriously. This policy sets out how we will deal with your ‘personal information’, that is, information that could identify, or is related to the identity of, an individual. All the information collected is obtained directly from you. This is usually at the point of your initial registration. The information will be collected via the membership application forms and renewal forms. At the point that you provide your personal information for membership purposes, we will also request that you provide consent for us to store and use your data (with effect from June 2018). Your consent is required in order to ensure our compliance with data protection legislation. See Appendix One. To liaise with U3A Head Office for the distribution of the U3A Magazine. To keep you fully informed of activities via the Monthly Email Newsletter and any other electronic or standard communication. We may send you, as required, messages by email, other digital methods, telephone and post to advise you of U3A activities. Internally - to Committee Members and Group Contacts as required to facilitate your participation in our U3A activities. Externally – with your consent for services such as direct mailing for the Trust magazines (Third Age Matters and Sources) and / or If we have a statutory duty to disclose it for other legal and regulatory reasons. We need to keep your information so that we can provide our services to you. In most instances, information about your membership will not be stored for longer than 12 months after you have left the U3A with the exception of the Email Newsletter from which we ask you to “Unsubscribe” when you no longer wish to receive it. The exceptions to this are instances where there may be legal or insurance circumstances that require information to be held for longer whilst this is investigated or resolved. Where this is the case then the member(s) will be informed as to how long the information will be held for and when it is deleted. To ensure the information we hold is accurate and up to date, members need to inform the U3A as to any changes to their personal information. You can do this by contacting the Membership Secretary at any time. membership@edenbridgeu3a.co.uk Details are on the website in the “Contact Us” section on the HOME Page. On an annual basis you will have the opportunity to update your information, as required, via the membership renewal form. Should you wish to view the information that the U3A holds on you, you can make this request in writing or email by contacting the Membership Secretary – as detailed above. There may be certain circumstances where we are not able to comply with this request. This would include where the information may contain references to another individual or for legal, investigative or security reasons. Otherwise we will usually respond within 14 days of the request being made. On your original application form and renewal forms which are held securely by the Membership Secretary. In spreadsheets accessed by Committee Members only. 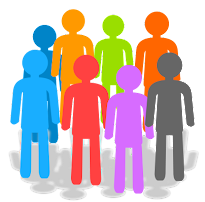 Group Contacts who may apply to a Committee Member for contact details about an individual member. Group Contacts who may hold contact details about members of their group supplied by the members themselves. This in turn may be shared with other members of the same group. The Treasurer will hold information on a spreadsheet about payment of subscriptions. All email addresses on the website (Committee and Group Contacts) are displayed in the format of "forwarding" email addresses which forward to personal email addresses. E.g. admin@edenbridgeu3a.co.uk or chess@edenbridgeu3a.co.uk These are to be found generally on the Contact Us Page, individual group pages and the Study Group Contact List. These emails are used only to forward to personal emails and have the advantage of not revealing personal addresses which should cut down on unwanted Spam emails. This is only available for Group Contacts and the Committee and the forwarding ceases if he/she does not carry on the role. It should be noted, however, that this is only a forwarding address and the personal email will be revealed once a reply is made. Replies can be made as normal by pressing REPLY. We have in place the security safeguard Secure Socket Layer (SSL) encryption, which creates a secure connection with your browser when you visit the website. External Links: - Whist we take great care to verify the security of any external links in the best interest of our members, please be aware that if these are accessed you will no longer be within the Edenbridge U3A domain and this policy will no longer be applicable. Photographs / video on the website: - To make our website as interesting and informative as possible, we include photographs taken by members which may include other members. Should any member object to a photograph being included on the website, please contact the website administrator and it will be removed immediately and without question. Copyright Notice: - We make every effort on our website to ensure that we only use our own images or copyright-free images and clipart. Where members have sent photographs which they have taken themselves for inclusion on the website, it is assumed that they give permission for them to be uploaded. 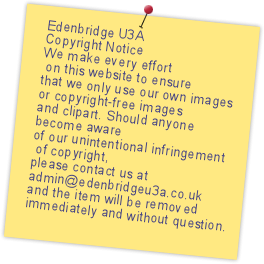 Should anyone become aware of our unintentional infringement of copyright, please contact us at admin@edenbridgeu3a.co.uk and the item will be removed immediately and without question. In a downloadable PDF format from the same pages on the website. · This policy may change from time to time. If we make any material changes, we will make members aware of this via the Monthly Email Newsletter and the Monthly Members' Meetings. The internet is a wonderful resource for sharing information, finding things out and indeed learning. At Edenbridge U3A, we work hard to keep you informed of what is going on, what has happened and what is in the pipeline for future events. All of this is done through our website. The internet, however can also create some issues of privacy and we would prefer that you are not affected by these. We have put together some advice to try to help you with this so that you can maintain your privacy. Reply to all: In most cases, small groups opt to share email addresses and everyone is happy with this as you may wish to contact individuals for whatever reason. However, you should consider when you reply to an email whether everyone needs to know what you are saying, especially in large groups. If, for example, you are given information about an event and the Group Contact asks you to reply to say whether you are going or not, ask yourself if everyone needs to know. It’s better in this case that you just REPLY to the sender who will note your response rather than using REPLY TO ALL and everyone in the group receiving unnecessary emails. 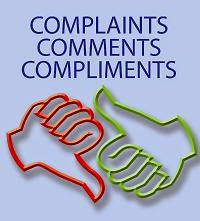 Email addresses on the website: The only email addresses on the website are those of the Committee and Group Contacts. You will notice that all the Committee and all Group Contacts have an “@edenbridgeu3a.co.uk” email address. This is simply a forwarding address to personal accounts but does not reveal the personal accounts which we wish to keep personal. This is only available for Group Contacts and the Committee and the forwarding ceases if he/she does not carry on the role. It should be noted, however, that this is only a forwarding address and your personal email will be revealed once you reply. You can reply as normal by pressing REPLY. What happens if you don’t use email: - We understand that not everyone wishes or is able to use email. This is your choice. However, as the U3A grows, it is becoming increasingly difficult for us to telephone everyone who does not use email about future events. We will try but we are all volunteers. You can help us by trying to agree an “email partner” (a friend or another member who uses email) – to keep you informed about what is going on. Perhaps you can give them a ring from time to time to remind them. If you feel you need to contact anyone about any of the above, please email the Website Administrator at admin@edenbridgeu3a.co.uk. The only people able to access data covered by this policy should be those who need to communicate with or provide a service to the members of the U3A. The U3A will provide training to Committee Members and Group Contacts to help them understand their responsibilities when handling personal data. Committee Members and Group Contacts should keep all data secure, by taking sensible precautions and following the guidelines below. Personal data should not be shared outside of the U3A unless with prior consent and/or for specific and agreed reasons. Member information should be reviewed and consent refreshed periodically via the membership renewal process or when policy is changed. The U3A requests personal information from potential members and members for the purpose of sending communications about their involvement with the U3A. The forms used to request personal information will contain a privacy statement informing potential members and members as to why the information is being requested and what the information will be used for. Members will be asked to provide consent for their data to be held and a record of this consent along with member information will be securely held. U3A members will be informed that they can, at any time, remove their consent and will be informed as to who to contact should they wish to do so. Once a U3A member requests not to receive certain communications this will be acted upon promptly and the member will be informed as to when the action has been taken. See Appendix One below. Group contacts communicating with their group members about specific group activities. Adding members details to the direct mailing information for the Third Age Trust magazines – Third Age Matters and Sources. Sending members information about Third Age Trust events and activities. Communicating with members about their membership and/or renewal of their membership. Communicating with members about specific issues that may have arisen during the course of their membership. The U3A will ensure that group contacts are made aware of what would be considered appropriate and inappropriate communication. Inappropriate communication would include sending U3A members marketing and/or promotional materials from external service providers. Where the U3A organises a trip that requires next of kin information to be provided, the U3A will require the member to gain consent from the identified next of kin. The consent will provide permission for the information to be held for the purpose of supporting and safeguarding the member in question. Were this information to be needed as a one off for a particular trip or event then the information will be deleted once that event or trip has taken place unless it was to be required – with agreement – for a longer purpose. The same would apply to carers who may attend either a one-off event or on an ongoing basis to support a U3A member with the agreement of the U3A. The U3A Committee are responsible for ensuring that the U3A remains compliant with data protection requirements and can evidence that it has. For this purpose, those from whom data is required will be asked to provide written consent. The evidence of this consent will then be securely held as evidence of compliance. The U3A Committee shall ensure that new members joining the Committee receive an induction into how data protection is managed within the U3A and the reasons for this. Committee Members shall also stay up to date with guidance and practice within the U3A movement and shall seek additional input from the Third Age Trust National Office should any uncertainties arise. The Committee will review data protection and who has access to information on a regular basis as well as reviewing what data is held. Committee members using strong passwords. Committee members not sharing passwords. Restricting access of sharing member information to those on the Committee who need to communicate with members on a regular basis. Using password protection or secure cloud systems when sharing data between committee members and/or group contacts. Paying for firewall security to be put onto Committee Members' laptops or other devices where the device is for the sole use of the U3A. · To store it securely for membership purposes. · To communicate with you as a U3A member. · To share with group leaders for those groups that you are a member of. · To send you general information about the Third Age Trust (the national organisation to which U3As are affiliated). I consent to my data being used for membership purposes as detailed above. I consent to my data being shared with the company who oversee the distribution of the Trust Magazines. The Edenbridge U3A Privacy and Data Protection Policy was approved and adopted by the Executive Committee on 27th March 2018.